Have you ever dreamed of being a puppeteer or joining a group of community-spirited performers? Here is a chance to develop your skills as a puppeteer and hopefully put them to use as a performer in a brand new puppetry troupe. Participants in this full day workshop will begin by examining a collection from the Patchwork Puppet Theatre that were recently donated by the estate of Margaret S. Mayer. The collection includes hand-made puppets in many different styles as well as original scripts designed to bring them to life. We will unpack the collection and, through a process of discovery, get to know the puppets and the stories they tell. Next, participants will go through a series of activities designed to develop skills as a puppeteer; focus, breath, voice and movement will be covered. How do these skills come into play in performances with puppets? How do you connect with your puppet and the audience through these techniques? After much practice, we will apply these skills to bring the stories of these puppets to life as we act out the scripts from this amazing collection. The workshop will conclude with a nuts and bolts session on how to make and manage a puppet theater company including ways to find opportunities, market your work, generate income and officially form a Company if desired. The end goal of this workshop is to collect a small group of inspired individuals around this puppet legacy and give them the training and confidence to bring them back to life. 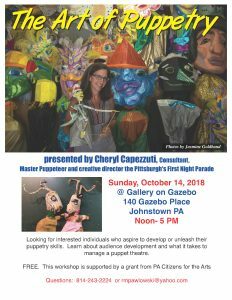 Cheryl Capezzuti has been working as a professional puppetmaker for more than 20 years. She is best known as the master puppetmaker and creative director for the First Night Pittsburgh Parade which is an artist-made, people-powered celebration of the new year that features over 300 giant puppets dancing in the street. She is an award-winner educator, recipient of more than 30 Artist-in-Residence grants from the PA Council on the Arts, a founding member of the Puppetry Guild of Pittsburgh and faculty member at Falk Lab School at the University of Pittsburgh. 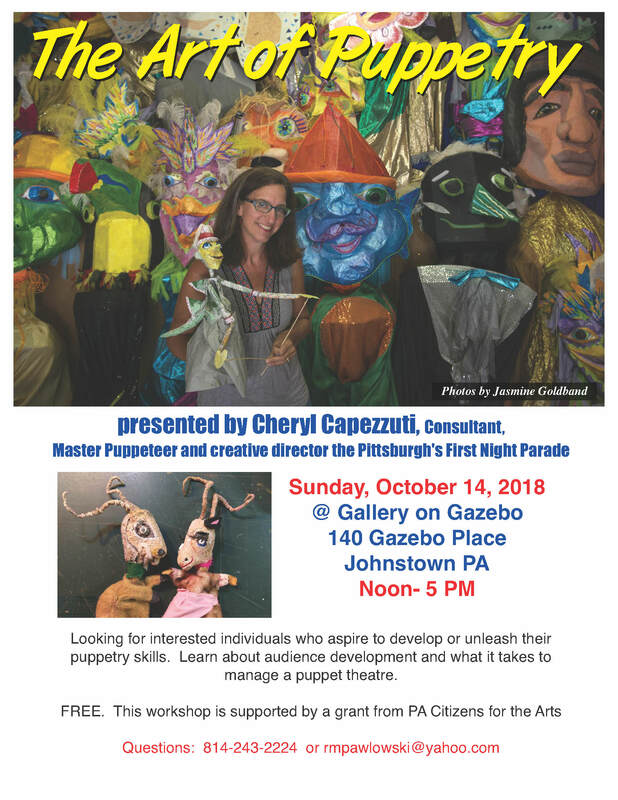 She conducts puppetry workshops all over Pittsburgh and is the go-to puppeteer for theater companies in Pittsburgh that want to bring puppets to life in their theatrical work. Learn more about her work at www.studiocapezzuti.com. Questions: call Rosemary Pawlowski, 814-243-2224. You can e-mail your registration to rmpawlowski@yahoo.com.